San Diego: Dennis McMillan Publications, 1984. 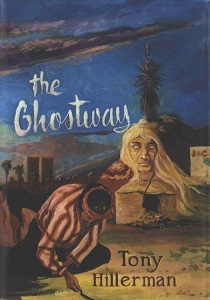 This is a hardcover, limited first edition of The Ghostway, with a full color dust jacket designed by Chista Cantú. This edition consists of a limited print run of 300 signed and numbered copies. Format: Hardback, 19.7 x 13.6 cm. Binding: Turquoise cloth covered boards with a small embossed silver design at cover center, spine lettered in silver. Full-color illustrated paper jacket designed by Chista Cantú.